Buprestis niponica, copyright Kohichiro Yoshida. 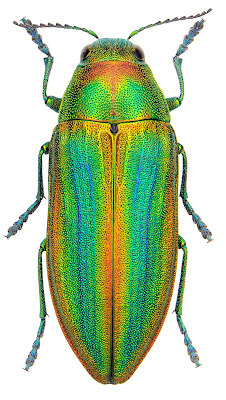 Buprestis is a genus of jewel beetles found in the Holarctic region, with the greater diversity around the Mediterranean and North America. Somewhere between forty and eighty species are recognised, depending on whether the closely related genera Cypriacis and Yamina are regarded as distinct or not. 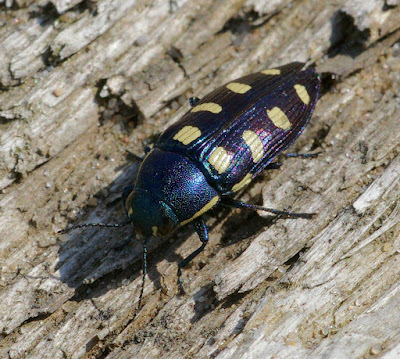 Species of Buprestis come in a variety of colours, with green, blue or black backgrounds often patterned with yellow or red. Female Buprestis octoguttata ovipositing, copyright Christian Fischer. Despite their attractive appearance, jewel beetles are not always welcome. They spend the larval part of their life cycle burrowing into wood so some are known for damaging timbers. The preferred hosts of most Buprestis species, where known, appear to be conifers such as pine, spruce and larch. They primarily attack dead and dying wood, and females of some species are known for searching the trunks of trees following fires to find where protective bark has cracked open (some jewel beetle species in other genera are commonly known as 'fire beetles' in reference to this habit). Buprestis larvae have been claimed to live for extraordinarily long periods. Mature beetles have been observed emerging from furniture and the like multiple decades after the original tree was felled, leading to claims of larval life spans of up to 51 years! It almost goes without saying that such inferences have attracted their share of scepticism, with detractors suggesting the possibility of eggs being laid after the wood was already worked. It is true that the low nutritious value of dry wood might be expected to lead to slow development, but how slow are you willing to believe? Is it known what a typical development time is in non-furniture circumstances? Just been trying to find that out. It looks like development times of a few years at least are definite. 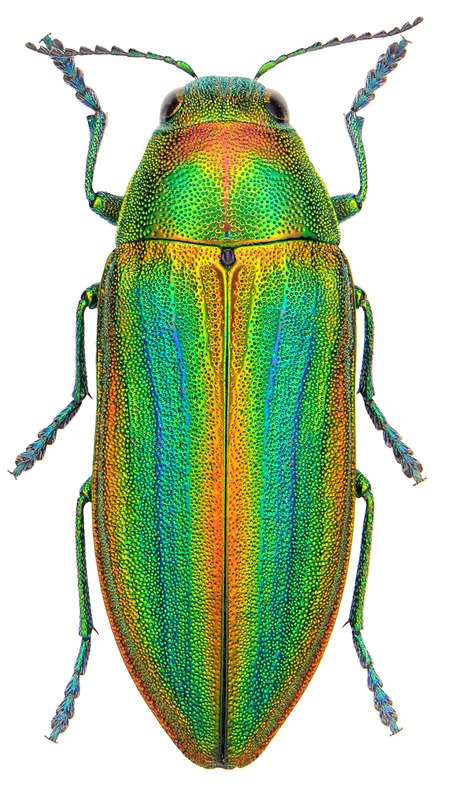 Buprestis aurulenta (the species involved in the 51-year claim) normally takes about two years to develop to maturity, but commonly takes up to four years when moisture levels are low.